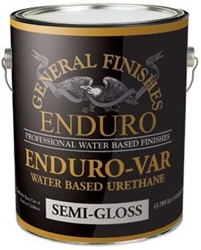 General Finishes EnduroVar Urethane varnish is an exceptional coating designed for high-end applications. While expensive, it is easily one of the most versatile and easiest to use waterborne finishes available. It sprays and levels extremely well and can be brush applied with fantastic results. It can even be padded on successfully with blue shop towels or our specialty wiping cloths. Exceptional durability and chemical resistance with a warm amber color that will enhance the tone of most premium cabinet woods such as cherry, mahogany and walnut. It will develop an amber look on lighter woods such as maple similar to an oil/solvent based varnish for a truly traditional effect. This is the ultimate waterborne finish that is suitable for hobbiests and professionals. NOT recommended over white or light colored base paints/primers as it may cause yellowing or a color shift.